Rotary’s Eglinton Club is glad to invite you to its special event intituled Canada’s Current Role in Foreign Affairs which will take place on June 29th in Toronto Lawn Tennis Club at 6:30 pm. 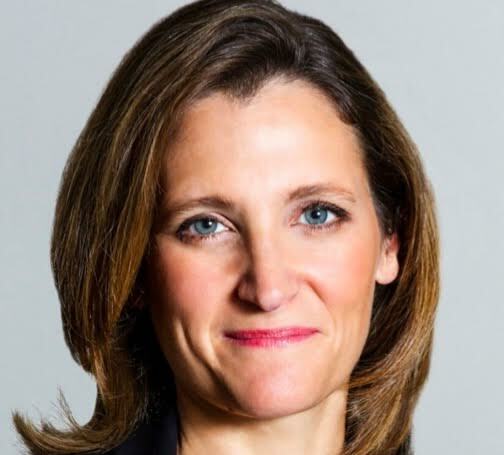 For that unique occasion, the Eglinton Club will have the participation of Hon Crystia Freeland, actual Foreign Affairs’ Minister. Ms. Freeland was first elected as the Member of Parliament for Toronto Centre in a by-election in November 2013 and then re-elected in October 2015 as the Member of Parliament for University–Rosedale. Between November 2015 and January 2017, she served as Canada’s 18th Minister of International Trade. An esteemed journalist and author, Ms. Freeland was born in Peace River, Alberta. She received her undergraduate degree from Harvard University before continuing her studies on a Rhodes Scholarship at the University of Oxford. After cutting her journalistic teeth as a Ukraine-based stringer for the Financial Times, The Washington Post, and The Economist, Ms. Freeland went on to wear many hats at the Financial Times, including U.K. news editor, Moscow bureau chief, Eastern Europe correspondent, editor of the FT Weekend Magazine and editor of FT.com. She served as deputy editor of The Globe and Mail between 1999 and 2001 before becoming deputy editor and then U.S. managing editor of the Financial Times. In 2010, Ms. Freeland joined Canadian-owned Thomson Reuters. She was a managing director of the company and editor of Consumer News when she decided to return home and enter politics. She has written two books: Sale of the Century: The Inside Story of the Second Russian Revolution (2000) and Plutocrats: The Rise of the New Global Super-Rich and the Fall of Everyone Else (2012).‎ Plutocrats is an international best-seller and won the Lionel Gelber Prize and National Business Book Award. In 2013, Ms. Freeland gave a TED Talk about global income inequality, based on the issues dealt with in Plutocrats. It has been viewed almost two million times.